In today’s market, there’s a nearly overwhelming selection of different iron sets. Even the professionals on the PGA tour play a wide range of irons, from tough-to-hit blades to ultra-forgiving cavity-backs to Bryson Dechambeau’s single-length set. So how does the amateur golfer know where to start? 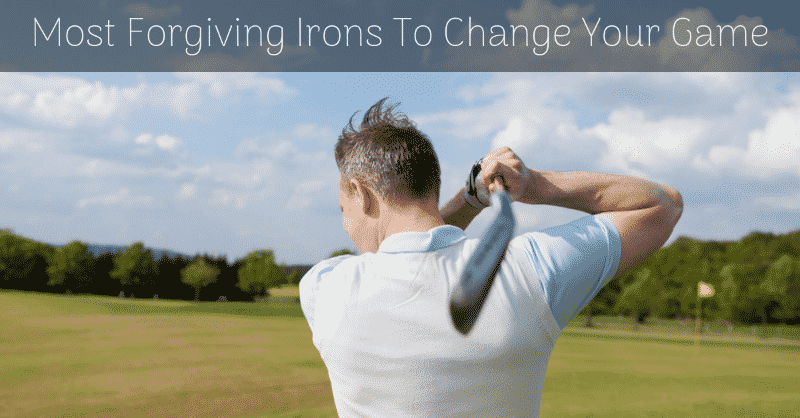 The #1 criteria for an amateur golfer’s iron set should be how forgiving it is. A good round of golf is when you can hit three shots that turn out exactly like you envision them before you swing the club. When even Hogan is satisfied by a mere 3 good shots per round, the average amateur will mis-hit the ball more often than not. So a forgiving set of irons that can turn a poor swing into a decent shot is a must. We’ve spent the last 3 months reviewing almost every iron set available on the market – and the Cleveland Golf 2018 Men’s Launcher CBX Iron Set is our winner. These irons are the most forgiving irons. Last Update: August 2018. By Jordan Fuller. In this update, we have added 2 more products that we recently reviewed, the Cleveland Golf 2018 Men’s Launcher CBX Iron Set and the TaylorMade Golf Rbladez Iron Set which recently came out – both great forgiving irons. 4.1 What is the difference between cast and forged irons? 4.2 Do I need a 1-iron? A 3-iron? A 9-iron? 4.4 Can’t I just buy a $50 set at a garage sale? 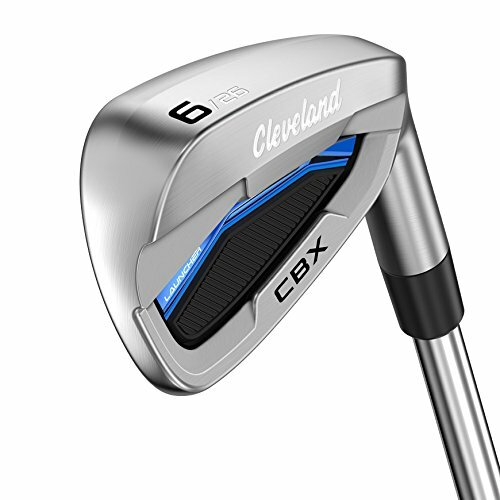 Cleveland is a company known primarily for their wedges, but with the Launcher CBX irons they’re making a big play in the iron market. Most noticeable upon first glance is the extremely thick sole, putting a ton of weight in the bottom of the clubface to provide a low center of gravity. This results in a quick launch and high ball flight, with great backspin and forgiveness. Golfers who struggle to hit the ball high enough to clear water hazards and stop their ball on the green will find a lot to like here. The thick sole cuts through rough like a machete and digs the ball out of the grass. It also makes it possible to get the ball in the air from tight fairway and even hardpan lies. Cleveland touts the “Cup Face” technology in the Launcher CBX irons, which increases the spring effect at impact and results in excellent ball speeds off the clubface. This helps heel and toe shots fly nearly as far as sweet spot strikes, though thin shots did see a noticeable distance loss in the long irons. Speaking of the long irons, they’re a bit thicker than the short irons. Some golfers may actually find the thicker toplines increasing their confidence, but I found the look a little off-putting. It seemed to me like they couldn’t decide if they wanted to be irons or hybrids. Ultimately, however, it’ll come down to your personal preference. Cleveland wedges are well known for their zip-grooves and laser milling, which is why you see such high usage both on tour and among amateurs. They’ve brought these features to these irons, maximizing the backspin produced and making it easier to get the ball to stay on the green. Zip grooves are micro-grooves in between the regular grooves you see on clubs, and they really help produce more spin than most amateurs are used to seeing. You might even find your 9 iron taking one hop and then sucking back a few inches. Cleveland has a winner on their hands with the Launcher CBX: a combination of great forgiveness and distance with high ball flights and max spin that will benefit most golfers. 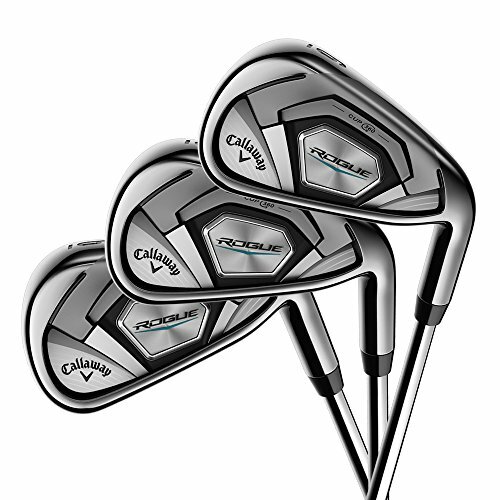 Callaway is one of golf’s truly premier manufacturers, featuring a stable of PGA Tour players like legends Phil Mickelson, Sergio Garcia and Henrik Stenson. 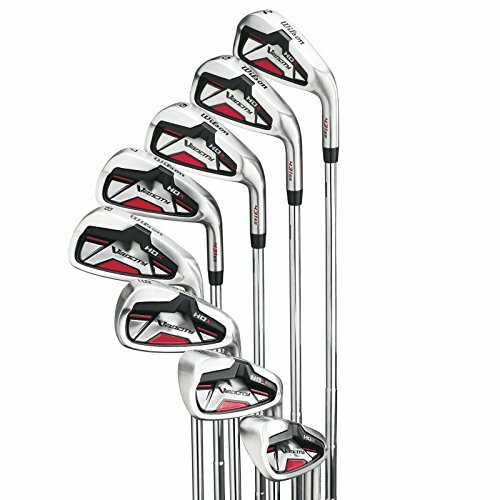 So when you look at the price of the X-Series irons, it may look like a misprint — these are priced closer to a starter set. But fear not, they deliver real performance that should satisfy most any amateur golfer. The X-Series irons are slightly oversized, which makes the hitting area look positively gigantic and provides for a large sweet spot. And when you hit that sweet spot, the ball rockets off the clubface. These were among the longest irons I’ve hit, with shots flying high and far. Classic Callaway performance, to be sure. The clubface is extremely thin, with a speed pocket right behind the hitting area. The design is classic and doesn’t utilize many of the bells and whistles you’ll find in more expensive iron sets. There’s no carbon fiber, no tungsten inserts — just a nicely perimeter weighted, oversized game improvement iron. The simplicity of the design results in a lovely club with a fairly narrow topline and an inviting hitting area. However, while there’s good forgiveness distance-wise, I found that the directional forgiveness wasn’t quite as pronounced as some of the top performers. Callaway seemed to focus primarily on maximizing yardage here, and they succeeded in that area to a great degree. Now I want to be clear, these still help with mis-hits. They’re not going to punish you for a mediocre swing like blades sometimes will, but you may notice that mis-hits suffer a little more than you’d like. But wow, do those sweet spot strikes ever travel! And the sweet spot is, in fact, quite large. 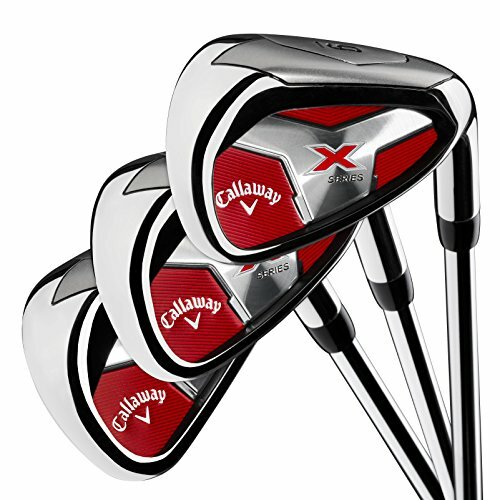 If you’re looking for an elite, tour-proven brand at a starter set price, the Callaway X-Series just might fit the bill. TaylorMade has earned a reputation in the golf world for constantly pushing the envelope, always releasing several different product lines each year and willing to try anything to push performance further. The Rocketbladez irons follow their Rocketballz woods in the quest for as much distance as the rules will allow. Rocketbladez achieve incredible ball speed numbers and attractively high launch angles with an extremely thin face and “speed pocket” technology in the 4-7 irons. This helps with the most common long iron miss: the thin shot. The low center of gravity and thin face helps get the ball into the air even on swings that seemingly should result in worm burners. However, their focus on distance leaves a noticeable gap in distance between a sweet spot strike and a heel- or toe-miss. Sweet spot strikes feel great and fly high and true. Mis-hits feel great, but float a little more and then tumble out of the sky short of the target. The polyurethane insert designed to enhance feel and sound does exactly that, dampening the vibration of poorly struck shots and delivering a nice click at impact every time. However, this sometimes left me wondering if I’d truly made a good swing or if the club was covering up some of my mistakes. I’d recommend these especially for someone playing in a cooler climate, especially if paired with graphite shafts. Anyone who’s played in 40-degree weather knows how painful mis-hits can be, but these help minimize that pain. On the whole, however, these are made for golfers who want to crush the ball as far as they can and worry less about where it’s going. High-tech at every turn, but at what cost? The TaylorMade M4 irons are bursting at the seams with new ideas and materials that TaylorMade hopes will make the ball fly further and straighter than ever. And they do produce great distance when you put a good swing on them. The problem I have is with the design choices they’ve made. From the rear, the clubs look a bit like Frankenstein’s monster due to the RIBCOR technology that makes the sole look almost detached from the clubface. This has a purpose, but it doesn’t look great. More of an issue is the way the club looks at address. They’ve added two vertical lines at each end of the grooves that make the sweet spot look smaller than it is, and make the toe look abnormally large. To top it off, they’ve shaved metal out of the hosel to reposition it elsewhere in the club. The repositioning of hosel weight is a novel idea, but it creates quite a distraction when I address the ball. The face lines plus the hosel make it hard to simply put the club behind the ball and focus on the shot. This may be a personal issue, but I felt that it negatively affected the performance of the club. They just didn’t feel as solid or as forgiving as other irons, and I didn’t hit as many good shots with them. In regards to the iron’s tech, I can’t argue with it. They’ve redistributed weight to the sole of the club and made the face thin and springy, which helps get the launch angle high. The sharp leading edge cuts through the rough nicely. TaylorMade claims RIBCOR stiffens the perimeter of the iron and helps with sound and feel, but I felt that the sound was somehow off; it was clunky even on well-struck shots. I think they’re heading in the right direction and with a little tidying up on a few design elements, TaylorMade could have a real winner on their hands. For now, I’d either try out the RBladez or wait for the inevitable M5. 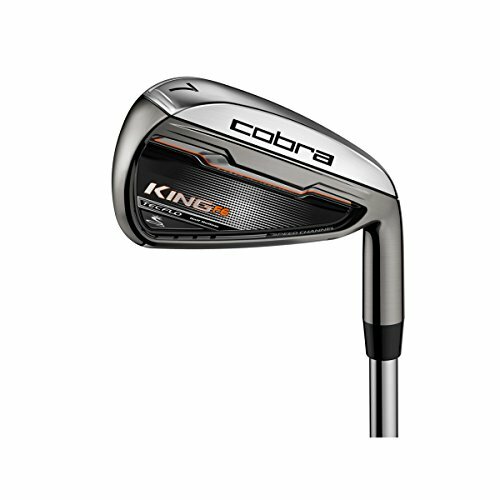 The Cobra King F6 Iron and Hybrid combo set is great for seniors or juniors who have trouble generating enough clubhead speed to get the ball up high in the air. Despite their low distance rating, slower swingers will probably actually hit the ball farther with these. However, high swing speed players will most likely launch the ball straight up in the air, hitting balloon shots that don’t wind up going as far as they’re used to. The launch issue could be a result of the fact that these are currently only being offered with graphite shafts that are fairly light and whippy. This is ideal for slower tempos. What I like about the set is the two hybrids that replace the 4 and 5 irons. Many players find it awfully hard to hit long irons, and these hybrids should take care of that issue. They scoop the ball right off the ground and dig it out of the rough with aplomb. The hybrids are so effective that the distance gap between 5-hybrid and 6-iron might be almost too big. I found the hybrids so easy to hit and so forgiving that the desired 10-yard gap between irons was extended to about 20-25 yards when going from 5-hybrid to 6-iron. The solution was to choke down a few inches on the 5-hybrid, but beginners may not feel very comfortable doing this. The irons have a clever variable groove design, with shallower V-grooves in the 4-6 irons to maximize distance, sharper U-grooves in 7-P to increase the spin on approaches to the green, and special wedge grooves in the gap and sand wedges to max out the spin around the greens. This is a nice extra touch that shows the level of thought Cobra put into the King F6 iron set. The dark gunmetal look is very attractive but will wear off quickly, and you’ll need to be sure you keep the clubhead on your hybrids as they’ll scratch up very easily. Overall, the King F6 is a well-designed set of clubs that slower swingers should take a good hard look at. Callaway’s Rogue line of clubs is designed with urethane behind the ultra-thin clubface that is intended to give extra bounce and distance at impact. These irons are no different: they’re about as long as any irons I’ve hit, with a nice penetrating trajectory. Forgiveness is sacrificed a bit here, as missing the sweet spot produces a thudd-y clank sound and a ball flight that leaves a little to be desired. The satisfying snap I’m used to hearing from Callaway irons is a little deficient here. Overall, the irons just feel extra stiff, like they’re fighting the ball instead of just hitting it. I found them remarkably easy to work from right to left and left to right, and they do look great. Squaring them at approach and nestling the irons behind the ball inspires a confident swing. The remarkable distance is a result of their Face Cup and Variable Face Technology that expands the springy area of the super-thin clubface. A tungsten weight in the toe puts the center of gravity in a low, forward spot to help get the ball up in the air quickly. However, I’ve found that tungsten is often the culprit in an iron that feels too stiff and sounds clanky. They do what they can to temper the sound with a pillow of urethane microspheres in the hollow space behind the clubface. I shudder to think of what they’d sound like without the urethane padding! The last thing Callaway has done to max out distance is to strength the loft of every iron. The 3-iron is 18 degree, which in years past would be called a 1- or 2-iron. The pitching wedge is 44 degrees, the loft of a Mizuno 9-iron. This might be why they fly so far but don’t have the forgiveness you’re expecting from the iron you’re hitting. But if you’re looking for breakout distance, the Rogues are hard to beat. Wilson has the highest-scoring clubs in my tests this year, the Staff C200 irons, which are quite a bargain compared to a lot of the other major brands. 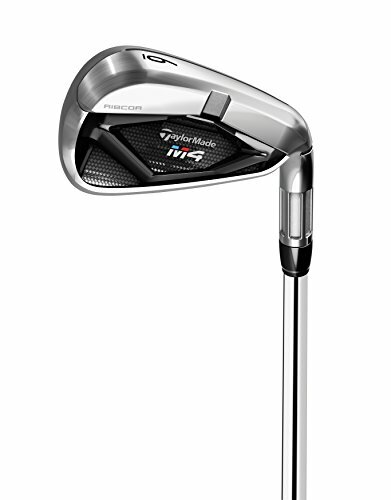 But they’ve got another good performing entry at an even lower price point — the Velocity HDX irons. 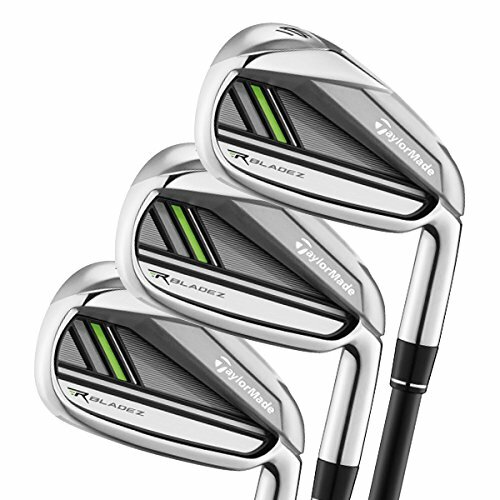 The Velocity HDX irons are aimed at the beginner/intermediate market. Golfers who haven’t played for a while and find their old irons outdated but don’t have a huge budget for irons, or beginners who might not be fully hooked by the game yet will find a lot to like here. First off, they aren’t the longest irons, but they’ve got a lot going for them. The deep undercut cavity offers a large sweet spot so the distance from each shot is remarkably consistent. And the center of gravity is as low as they come, making it easier to get the ball up in the air quickly. No more worm burners. The clubheads are very large but they still cozy up behind the ball reassuringly, looking incredibly easy to hit. The hard casting of the clubheads leaves something to be desired as far as feel goes, feeling a bit like a brick at the end of a stick. But the results speak for themselves: consistently straight shots. One more nice touch on the Velocity HDX irons is that they do come with a sand wedge, so someone looking to just get into the game won’t have to worry about purchasing separate wedges, and they may appreciate the consistent look of having all the same irons and wedges. The grips included are low-quality and will likely wear out before long. But I recommend changing your grips every winter anyway, and these should at least last you one season. Many golf stores will offer free installation with grip purchase during the off-season, or you can learn how to do it yourself — it’s really not too difficult. This is the iron set I’d recommend for beginners; they’re much better than off-brand knockoffs you may find in the same price range. Wilson is a huge name in the sports world overall, but to many golfers they’re an afterthought. 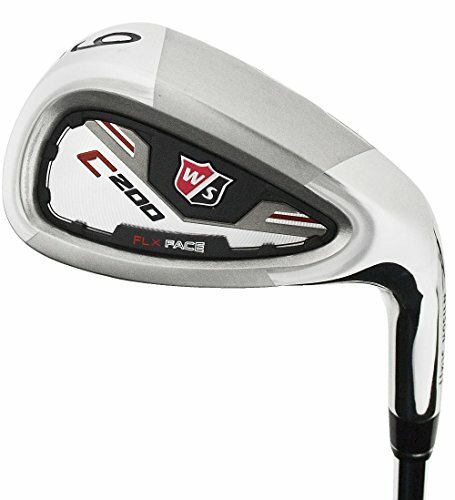 The Wilson Staff C200 irons should change that view once they’re in your hands, however. They’re great-looking clubs that have a nice thin topline and the classic look of blades that hide some remarkably effective design tricks. Wilson has drilled “power holes” around the perimeter of the clubface to increase the face flex, which is designed primarily to maximize distance but also helps with forgiveness. The spring effect gives the irons a huge sweet spot, so it’s hard to mis-hit them. Even thin impacts fly almost as far as pured strikes, and heel and toe shots see minimal distance loss as well. If there’s one drawback to the irons, I’d say that the ball tends to fly too straight. That sounds ideal to many golfers, and it should, but better golfers will want to hit intentional draws or fades to attack tucked pins. The Wilson Staff C200 irons don’t impart much side-spin to the ball, so if you aim right of the pin and try to hit a draw, the ball is likely to fly straight where you were aimed and wind up right of the target. Most amateurs, however, would benefit greatly from hitting straight shots to the center of every green. The Wilson Staff C200 irons are designed well for that. And the distance gains are good enough that you’ll be more comfortably hitting a 4-iron off the tee on a tight, short par 4. The irons feel great in your hands, but the “power holes” do give them a bit of an odd click at impact. Wilson has filled the holes with urethane to help mitigate the odd sound, but it’s still different than most irons I’ve hit and takes some getting used to. The performance of the irons should help you overcome any misgivings about the sound of the irons in no time. Wilson is a long-standing, reputable manufacturer so I expect these irons to last you many years. Tour Edge is a small company headquartered in the Chicago suburbs. They don’t have any official tour players, but many tour pros use their fairway woods without any official endorsement. That should be enough proof that they know what they’re doing as far as clubmaking. 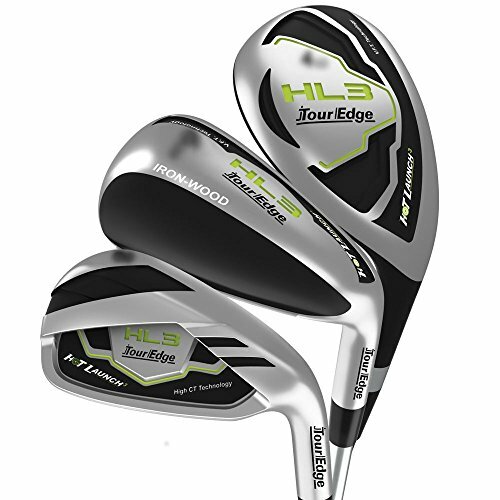 The Hot Launch 3 is a combo set of hybrids, “ironwoods”, and irons. The hybrid long irons resemble small fairway woods and are very easy to pluck off the turf and launch straight up into the air. For those of you who have trouble hitting anything other than a wedge, this could be the answer. The ironwoods are a new concept: essentially, they’re a hybrid of a hybrid and an iron. Sounds silly, I know! But many players find that even mid irons are tough to hit high enough to keep the ball from rolling over the green, and the help that the rounded back provides on the Hot Launch 3 ironwoods is significant. The 8-iron and up are more traditional cavity-back irons, but taken to the extreme for forgiveness, with the sweet spot extending nearly across the whole face. Across the set, these have giant sweet spots that are nearly impossible to miss. The ball flies about as far on a toe hit as it does off the middle of the clubface. The perimeter weighting and Tour Edge’s variable-face-thickness technology see to that, offering the best forgiveness overall of any of the irons tested. However, the overall distance from both good and bad strikes was noticeably lower than other irons in my tests. I found I had to use a club extra on most shots to make sure I was able to clear the hazards and get the ball all the way to the green. The high trajectory also made the ball more susceptible to the wind, and the design of the clubs made it tough to produce a lower ball flight even with a knock-down swing. The Hot Launch 3 is a great set for beginners who are having trouble hitting irons across the board. Better players whose ball flight is too low or who are willing to give up some yardage in order to hit straighter shots should also be interested in these. The durability rating comes from the fact that the paint seems to chip and scratch fairly easily, so it won’t take long until these look a little beaten up. I’d suggest headcovers for both the hybrids and the ironwood. All in all, a great entry from a quality manufacturer. Mizuno is a unique manufacturer because they own their own forging plant and manufacture their own irons rather than outsourcing the forging and casting. Most other manufacturers send their designs to one of a few plants around the world, so you may have the same factory making a few different brands of clubs. Not Mizuno. Theirs are all made in-house using their patented “grain-flow forging” technique that produces some of the best-looking and best-feeling golf clubs available. The process is quite interesting and entertaining to watch. The JPX-900 irons are a cavity-back design, but still made with better players in mind. It offers surprisingly good forgiveness for how workable the iron is, but the lack of offset and relatively small head-size might be too intimidating for beginner-to-intermediate players. Mizuno always makes some of the most beautiful clubs, and the JPX-900s are no exception. The thin topline and classic head shape rest perfectly behind the ball, but the small clubhead size might be a turnoff if you’re used to oversized irons. Since most forged irons are made to be workable and not as forgiving, the JPX-900s are a bit of a surprise, as the sweet spot is quite large. Toe and thin shots both wound up close to the target. And yet, I could still produce draws and fades with relative ease. If you’ve been working hard on your game and are trying to break into the single digits with your handicap, you may be ready to try out an iron like the JPX-900. 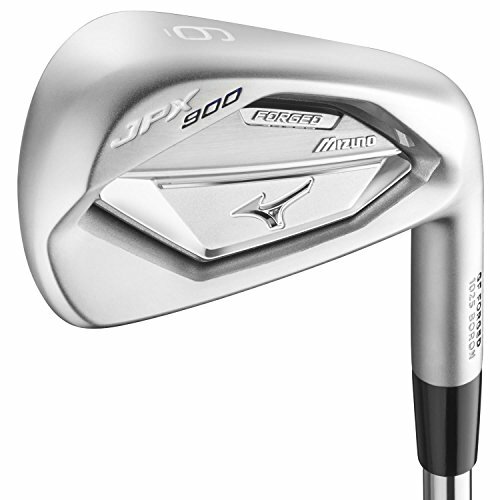 Since the JPX-900s are forged, they won’t be as durable as other entries on this list. Forged irons are raw metal covered by chrome plating, and as the chrome wears off, the metal underneath will rust. If you play several times a week, you’ll need to replace forged irons every few years, whereas cast irons will last you a decade or more. However, the buttery soft feel of a purely struck forged iron is truly one of the best feelings in the world. Once your game has improved enough that you can intentionally hit draws and fades and don’t need quite as much forgiveness from your irons, Mizunos are worth investigating. This article is intended to find the most forgiving iron sets available today, so obviously the first and most heavily weighted criterion is forgiveness. Worth a max of 40 points, the forgiveness rating takes into account both distance and directional forgiveness on heel, toe, and thin shots. There’s not much a club can do to correct a chunk! You may find one set more forgiving than another because you tend to miss your shots thin only, and so a low center-of-gravity iron would be perfect for you. If your miss tends to be on the toe, you may want to find an oversized iron with a larger sweet spot. And if you tend to miss towards the heel and slice the ball, a club with an extreme offset might fit the bill. If the forgiveness level between two clubs winds up being about equal, you’ll want to squeeze as much distance as you can out of each shot. The closer you can get to the green on a par 5 or a long par 4, the better chance you’ll have of making a good score. And wouldn’t you rather hit a 9-iron to a 150-yard par 3 than a 7-iron? Hitting a club with more loft offers more backspin and thus more forgiveness and accuracy. So the distance potential of a club actually has a pretty big impact on the forgiveness level of an iron set. With this in mind, irons can earn a maximum of 30 points of distance rating. The last three criteria will receive a maximum of ten points each. They’re the little things that can sometimes help tip the scales between otherwise closely matched iron sets. First up is feel. Feel has two components: first is how the club feels when it strikes the ball. A good strike should feel smooth and buttery, almost like the ball just leapt off the clubface rather than being impacted by it. Second is how it sounds. A lot of golfers don’t realize this until they hear a sound they don’t like at impact. A satisfying click will make an iron feel much better than a clunky thump, even if both shots turn out identically. Feel plays a big part in your confidence. If you’ve hit a few great-feeling shots on the driving range before the round, you’ll play with more optimism and confidence. I’m of the opinion that looks are overrated in the golf world. Many golfers fawn over shiny chrome forged blades, but are they really the best clubs? For 99.9% of players in the world, the answer is no. Henrik Stenson is considered one of the best and most consistent ball-strikers in the world, but even he uses cavity-back irons. The loss of performance on even a slight mis-hit when you’re using blades is so drastic that I don’t recommend them for any golfers at all. The performance level of cavity-back irons is so high that I think every golfer will benefit from them at all levels. I also think results can quickly change your opinion on a club’s looks. An “ugly” club that consistently hits the ball right at the flagstick will become beautiful in no time at all! Durability for an iron set can be measured in a few different ways. All clubs will show bag chatter unless you use individual headcovers for each club (which I think is overkill — leave headcovers for woods, hybrids and putter only), but some forged clubs will look ten years old after just a few rounds played. Cast irons, on the other hand, might not feel as smooth but will show much less wear and tear even after a few seasons of play. Grips will always wear down and should be replaced at minimum once a year, so unless there’s something horribly wrong with the grips, I won’t take them into account for durability. Clubheads should be stable and secure in the shaft. Steel shafts will be more durable than graphite, but even graphite shafts should last for a decade or more. Since I’m only testing 2018 models, there will have to be an egregious lack of build quality to lose points in the durability category. What is the difference between cast and forged irons? Cast irons are made from molten metal poured into a mold. They take the shape of the mold and are then cooled. Cast irons are typically the most durable, but also the hardest feeling clubs. Forged irons are made from a single piece of superheated metal that is shaped into the proper shape. This result in softer, better feeling irons but they wear out more quickly. Once the chrome veneer is worn off, the metal underneath will rust and the irons will need to be replaced. Do I need a 1-iron? A 3-iron? A 9-iron? Most sets today come with either 4-iron through pitching wedge or 5-iron through pitching wedge. Long irons, like 3- and 4-irons, are typically the most difficult clubs to hit, even for professionals. So hybrids have taken the place of many long irons. Until you’re a scratch golfer, I wouldn’t even think of attempting to hit a 1-, 2- or 3-iron. And if your 4- and 5-irons are frustrating you, there are quality hybrids that will make your life on the course much easier. A few of the sets we reviewed are combo sets that offer hybrids for the long irons and traditional irons for mid- and short-irons. For beginners, I’d recommend a set as such: Driver, 3-wood, 5-wood, 5-hybrid or 5-iron, 6-iron thru pitching wedge, gap wedge (50-52 degrees), sand wedge (56 degrees), lob wedge (60 degrees), and putter. This will set you up with the best chance of success. Cavity-back irons are designed to have large sweet spots made possible by moving the weight of the club from the back of the iron to the perimeter. A blade (or muscleback) has the weight centered behind the sweet spot. This may sound nice, but you have to hit the ball purely every time. Miss the sweet spot by just a fraction of an inch and your ball will lose a ton of distance. For this reason, I suggest cavity-backs for all levels of player. Even the best professionals don’t hit the sweet spot every time, and a cavity-back will help this mis-hits still make it close to the original target in a way that blades just can’t pull off. Can’t I just buy a $50 set at a garage sale? If at all possible, I suggest getting fitted for your irons. If that’s not possible, try to hit demos of the irons you’re considering at a golf store. And if that’s not an option either, I’d still suggest you buy a new set of clubs. 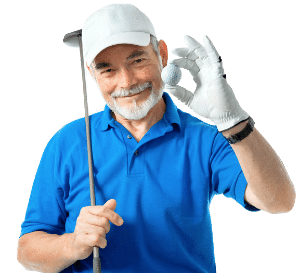 Technology has come a long way in recent years, so older clubs will really hamper your efforts to have fun playing golf. Used clubs can also have been hit so much that their lofts and lies have been knocked off-kilter, or they may have been custom-fitted to a golfer with a very different swing and stature than you. And their grooves are likely worn down from use, which reduces the amount of backspin you can generate. Backspin helps get the ball into the air, fly straighter, and stop when it lands on the green.